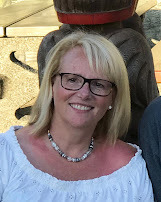 Today I'm sharing a CASE of a card I received from my friend Diane Evans. She used the Leaf Punch to create a stunning wreath card for Christmas. 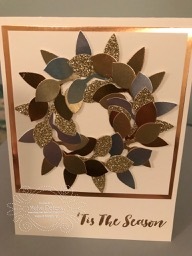 I just love the mix of the metallic foil sheets and glimmer paper in the wreath. Diane embossed the sentiment with Gold Embossing Powder. It's hard to see how the card catches the light in the picture. For my card, I stayed true to Diane's card, just changing the sentiment. I think I used more leaf pieces that Diane did so my wreath is a little fuller. 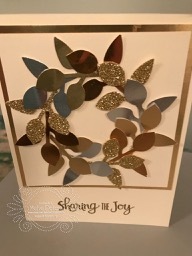 This card is so easy to make and you could switch it up and use green papers with some rhinestones coloured red with the Stampin' Blends to add some detail. So many ways. Punch out 4-5 leaf pieces in each of Gold Foil Sheet, Silver Foil Sheet, Copper Foil Sheet and Gold Glimmer paper. Use the circle as a guide to start adhering the leaf pieces. I put the stem of the leaf up and adhered with Glue Dots. I then layered over it and went clockwise around the circle. Online Extravaganza is back with amazing deals November 20 to 26th. There are also some ONE DAY FLASH deals for November 20th only! Check out the entire sales flyer by clicking here. You can place your order on Monday morning by shopping on my Online store or by emailing me. 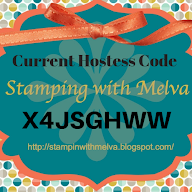 Use the host code when you order and receive a free gift from me! If your order is over $200, please do not use this code, but you’ll still get the free gift. I'll send you a set of 4 cards as a Thank You gift including the instructions so you can make at home. Online Extravagana - Don't Miss out! Are you excited for the Stamparatus?